I have collected cookie cutters most of my adult life, although I rarely use them outside of the Christmas baking season. They’ve come in handy for quilting designs, so I don’t feel too guilty about the number of cutters I’ve acquired. Still, your tools tell people something about you. My husband and I have been writing family biographies, and we’ve been amazed and amused at the tools our relatives collected, kept, and used. As a novelist, I have given my characters something interesting to use in order to give the reader a better understanding of who these people are. Once I’ve decided what I want the reader to know, I insert the proper tool. My quilting heroines, for instance, use fabric, thread, and scissors in various scenes. As a biographer, I have to work backwards. I need to tease out what the tool meant to my relative based on what I remember and the stories told to me so I can better understand who this person was. So here’s the deal, should anyone want to write my biography through the lens of my cookie cutters. I like bright, shiny things. I like tiny, cute things. I like cookies. And that’s really all these tools say about me. I love gizmos like the item pictured above. This one has a compass, magnifying glass, ruler, straight edge, curved edge, and long cord for hanging around your neck or on a pack. What kind of person would need such a multi-tasker? What kind of person would think of cramming so many tools into one small object? When I start building worlds for my science fiction stories, I have to create the tool as well as the society that makes it, and I often start with things available here, but not ones that I normally use. Your prompt is to imagine a tool your character would need, using the item above as a starting point, and build the world of your story around it. A painter friend, Janne Henriksen, was talking about art at a party recently. We discussed technique and process, and how she paints, and what tools or guides she finds useful. That’s when I realized I would be a much better artist if I would first find and then use the many tools I have bought over the years. My favorite design tool is graph paper. Graph paper is the single most useful thing a quilter can stock. 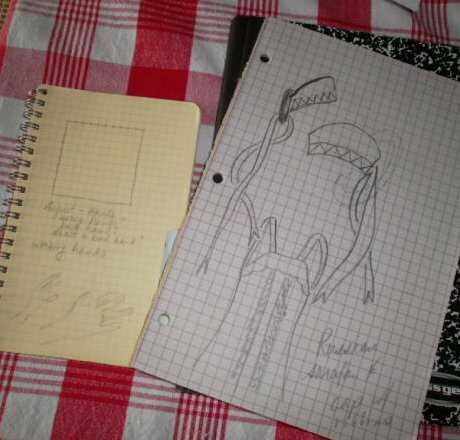 My sketching skills are minimal, but give me a pad of graph paper and I can recreate the lines and angles of interesting shapes in a format that will help me create something wonderful in fabric. I’m also fond of marking tools. 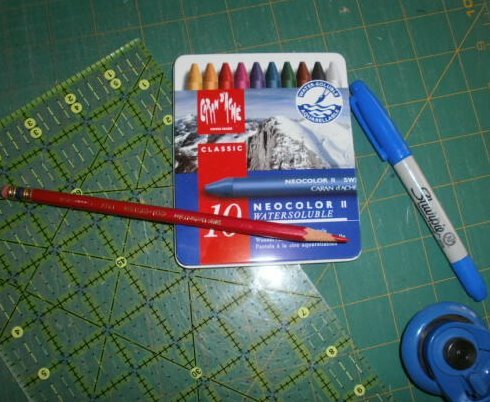 Colored pencils, markers, slivers of soap – anything that lets me add a line to fabric is welcome in my studio. Sometimes I need a sewing line, sometimes a cutting line. Sometimes I want to intensify the color of the fabric, sometimes I want to hide it (and sometimes I want to hide where the seams don’t quite meet). When my free-hand drawing skills fail me, I turn to stencils. 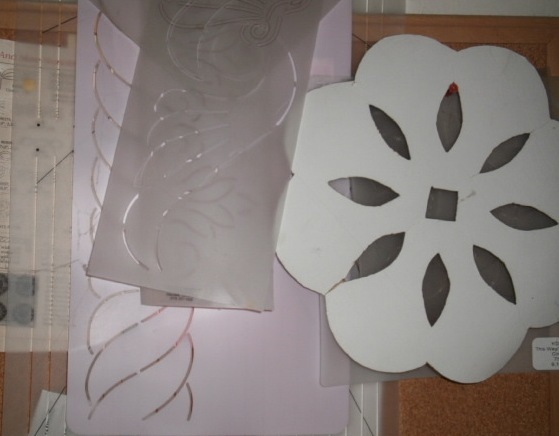 Stencils are great for quilting, embroidery, or beading designs. I like to look at them when I’m stuck for a piecing idea, too. No, I don’t do curves or pointy-points, but you’d be surprised at how the brain kicks into problem-solving gear if the fingers think they’re going to have to do something hard at the sewing machine. Of course, even the most highly motivated creativity session can end in disappointment. This is where the most important design tool comes in handy. 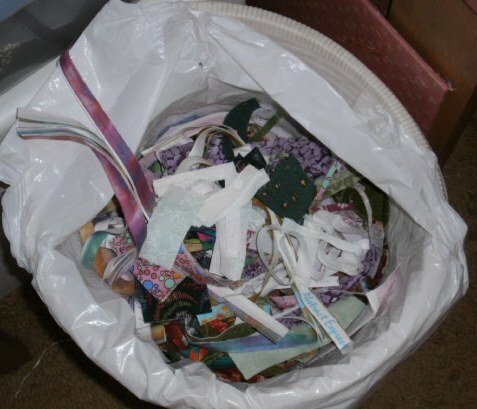 I decided long ago that agonizing over $1.15 worth of fabric and half an hour of my time was silly. I give you permission to bury your mistakes, too.